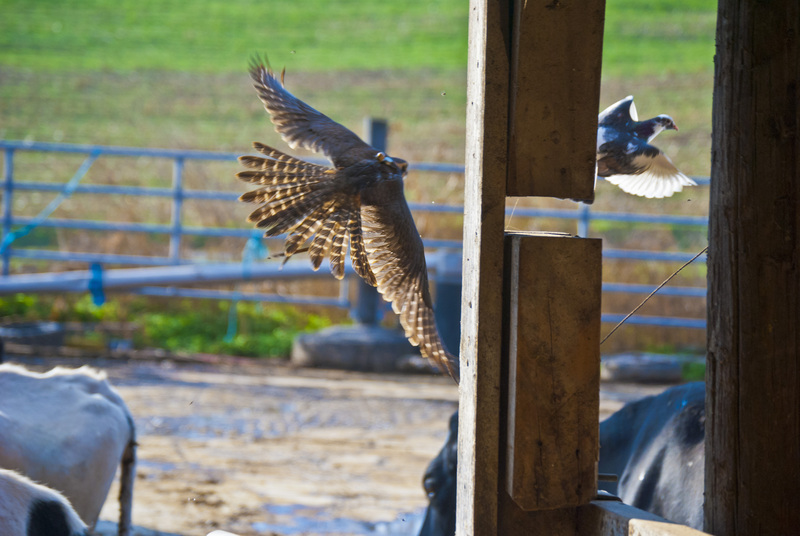 The Aplomado falcon, coined the "Falcons of Steel" by James Ingram, are quickly becoming a household staples in the falconry culture. Their calm demeanor attaches to a personality of with a never give up attitude makes for one of the most entertaining birds to fly. The quarry of choice can range from sparrows all the way to small ducks and even pheasant. More commonly they are flown on middle of the road size birds like starling and pigeon. Although a pigeon can be quite a bit of work for a male. The Aplomado is almost always flown in direct pursuit. 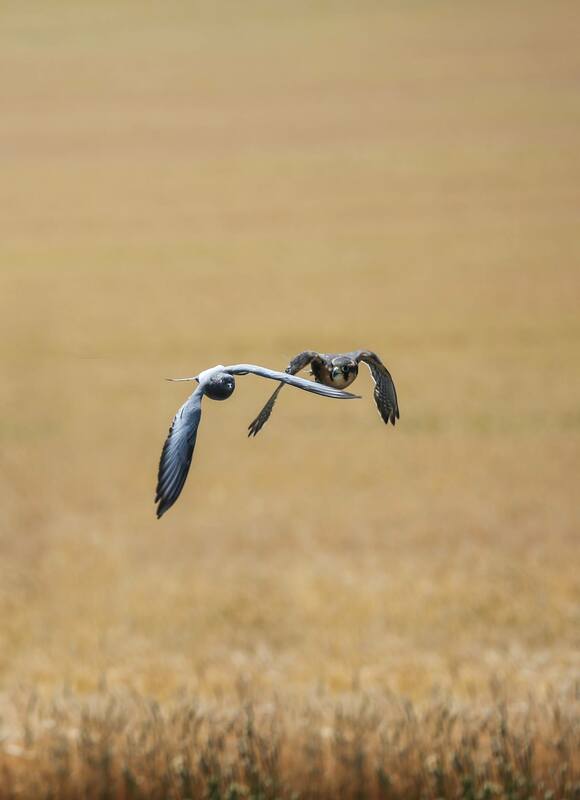 They tend not to wait on like traditional long wings although they are in the family. Their well known for the "target lock" in which they will isolate a target quarry and fly it down until the quarry is so exhausted it must put in to cover. At that time the aplomado will follow the quarry in for the final hit. Adjacent is Rob Giroux's female aplomado in direct pursuit of a pigeon. Although the quarry often tries to put in to a building or thicker cover, and the aplomado does not always follow in. I don't have a theory on what makes or breaks the decision to enter. This is often a great time for the falconer to assure the bird of their value by providing a re-flush to the waiting bird. Opposite is Richard Hiester's female, Victoria, chasing a feral from a re-flush after the pigeon hit the rafters inside an open enclosure. 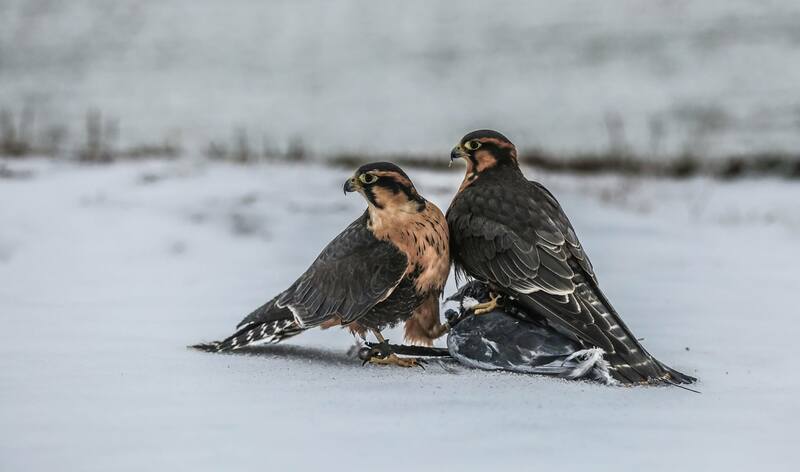 The aplomado falcon is one of the few birds that readily adapts to flying in cast. To the right is Rob Giroux's female/male team. The female is one year older than the male, and in this photo the female is once inter-mewed and the male is first year.